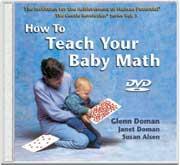 This DVD provides parents with a simple and clear daily program for teaching math to their babies while simultaneously enriching their mutual love and respect. It covers the basic philosophy plus all the "how tos". Included also are mothers and children who demonstrate how easy it is to learn joyously together.